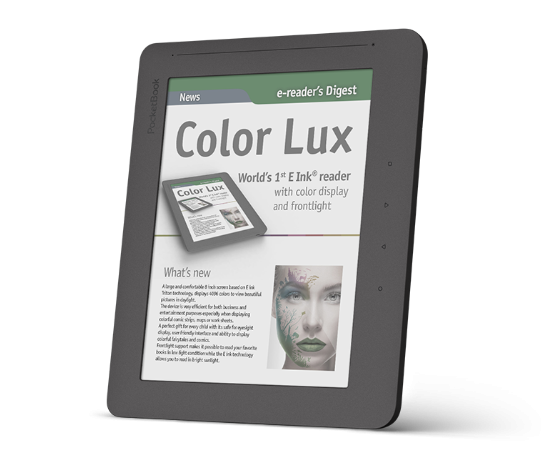 Brand new 8" reader based on E Ink Triton technology displays 4096 colors, which provides beautiful and diverse color image. The device is great for reading both business and entertainment periodicals rich with photographs, maps or tables. Ease of use and joy of reading colorful fairytales, make this device a perfect gift for every child. PocketBook Color Lux display doesn’t flicker and is identical to a paper book. That's why even continuous reading makes eyes less tired than reading on TFT screens (tablets, smart phones, computers). With the PocketBook Color Lux you may forget frequent recharging of your device. One battery charge is enough for 5,400 page turns, which is almost a month of active reading! Device functionality is not limited to reading only: with PocketBook Colour Lux you can also listen to your favorite music, work with documents, take notes. Your device supports Text-to-Speech, which will voice a book in the set of languages. PocketNews and BookStore services let you find and download the most fascinating content. Built-in Wi-Fi module opens up endless opportunities even for the most experienced users! The device has an integrated ReadRate service, which lets you share quotes, you liked, favorite books, or your personal experience in social networks. E Ink Triton matte screen surface does not glare in the sun, while the frontlight provides comfortable reading, even under low light. Using the PocketBook device is still simple, exciting and, which is most important, comfortable due to the multi-sensory display and unique interface. PocketBook Color Lux is notable for its elegant, smooth lines, slim body and soft-touch cover. With an 8" display and in-built frontlight the new reader weighs just 300 grams and perfectly suits your palm. 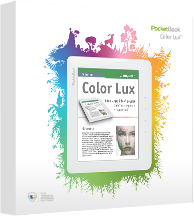 PocketBook Color Lux, as well as any PocketBook line device handles easily more than 16 e-books formats (PDF, PDF (DRM), EPUB, EPUB(DRM), DJVU, FB2, FB2.ZIP, DOC, DOCX, RTF, PRC, TCR, TXT, CHM, HTM, HTML).